‘Tis the season of the mature herb garden, and harvesting culinary herbs is definitely the thing to do now in order to preserve the tastes of this summer’s special seasonings. You can, of course, dry and store these all-natural flavorings, and use them in meals this fall and winter, but why not get creative and try your hand at making herb vinegars? Tarragon vinegar is probably the most well-known herb vinegar, but other herbs such as dill, burnet, borage, mint, lemon thyme, lemon grass, fennel, basil, rosemary, chives, sweet marjoram and even tangy nasturtiums can also add their own distinctive, tasty flavorings to vinegar. You can even let the mad scientist in you come out and play to combine different herbs to brew up one-of-a-kind culinary concoctions. 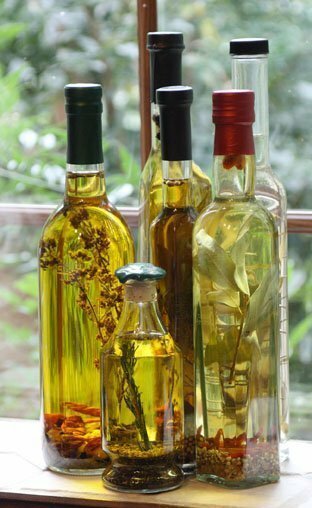 To start, harvest herbs early in the morning when their oils are more concentrated. After washing and patting them dry, take four ounces of fresh herbs and add them to a quart of cold vinegar. (Culinary hint: For a smoother flavor, use either red or white wine vinegar.) Close the bottle tightly, place it in an indoor location that is not in direct sunlight and allow the mixture to steep for two to three weeks. During the waiting time, occasionally shake the bottle to stir the contents. After the mix has steeped, you have a choice: Either leave the plant particles in the vinegar and use the concoction as is, or, for a better-looking finished product, strain the herbs from the liquid with a paper coffee filter. What remains is a solution free of particles but still tinted by the herb. Many home bottlers then add a few fresh herb sprigs to the vinegar for a decorative touch. Don’t limit the contents of herb vinegars to just leaves and stems. Cinnamon sticks, garlic cloves, peppercorns, chive blossoms, hot peppers and even citrus rinds can be dropped into the finished brew to add eye-catching accents as well as their own unique flavor punches to the vinegar. Need a few herb vinegar combination suggestions? Rosemary and white wine vinegar look and taste great by themselves, but add a dozen leaves of purple basil to tint the liquid a deep crimson and give the blend a snappier flavor. Red also rules the culinary spectrum in a mix of red wine vinegar, basil (any kind), oregano and thyme that makes a great salad dressing or marinade. Once the herb vinegar is made, fancy bottles are a nice finishing touch, especially if you are thinking about giving them as gifts. Make sure the bottles are clean, made of clear or slightly tinted glass and have an airtight cap. The cap can also be spiffed up with a wax seal or colored metal foil wrap. Finally, consider adding a tag that reveals the herbal ingredients, so recipients will know what to expect before they use the special vinegar in the kitchen. As a decoration, bottles of herb vinegar can serve as a room accessory for a few years. However, as an edible accent, to be safe, they should only be used within a year. Generally, the more herbs you add to the finished product, the less acid the solution becomes, so its ability to preserve the contents is diminished. On salads, poultry, fish and meats, these homemade herb vinegars can really add new life to old recipes. But even if they aren’t used in the kitchen, these bottles of the best from this summer’s herb patch still look great sitting on a window sill, and serve as reminders of past garden successes and the glories yet to come. L.A. Jackson is the former editor of Carolina Gardener. Want to ask him a question about your garden? Contact him at his website: southeastgardening.com.